Kanarraville Falls was really a series of attractive waterfalls within Kanarra Creek Canyon that passed through a pair of attractive narrows while also presenting scrambling obstacles to overcome in order to proceed further up the canyon. 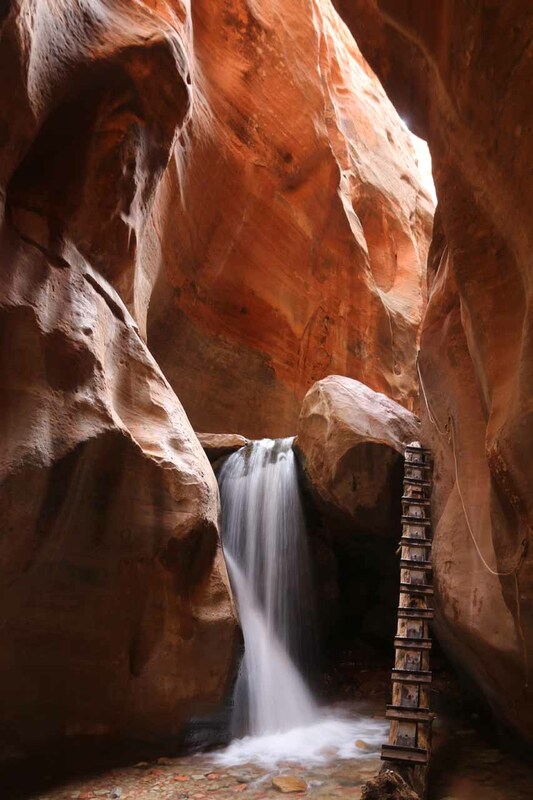 Two of the waterfalls had ladders to facilitate further progress, and they have become iconic signatures of this excursion that was known mostly to locals before social media and the internet let the cat out of the box, so to speak. 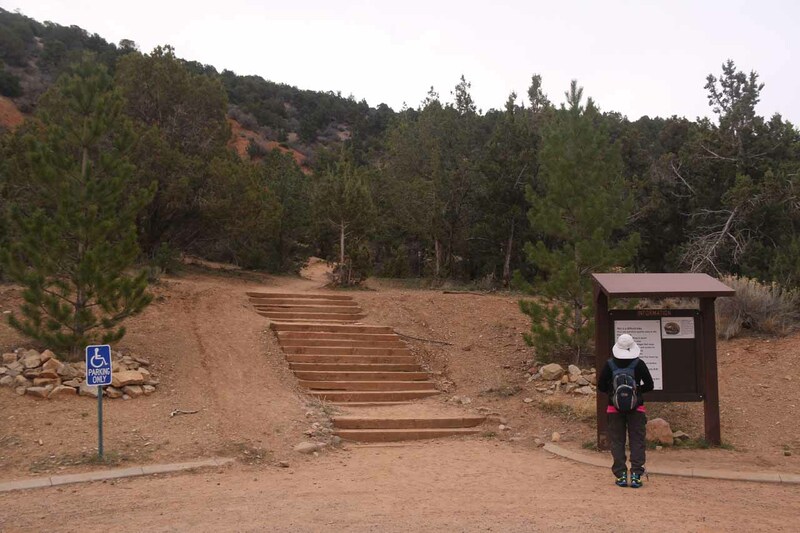 When my Mom and I did this hike mid-week in early April 2018, we were one of the first to get started, but when we returned to the trailhead after midday, this place was very busy. 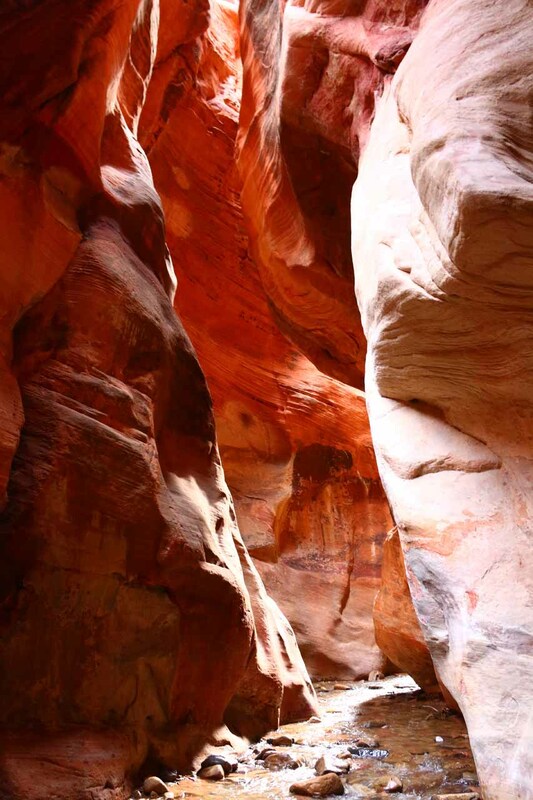 In addition to the waterfalls, I found the pair of narrows (also responsible for each of the major waterfalls on Kanarra Creek) to be very attractive. 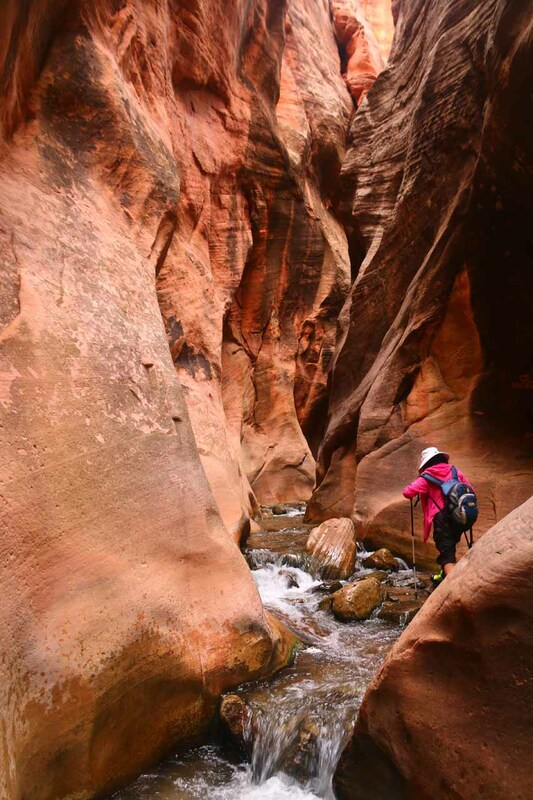 While they may not be thousands of feet high like in the famous Zion Narrows, the sandstone walls of Kanarra Creek were tall enough to still experience something quite like (perhaps better than) the Zion Narrows itself. As you can see in the photos on this page, the colorful red and orangish walls was great for photography as well as on the eyes. 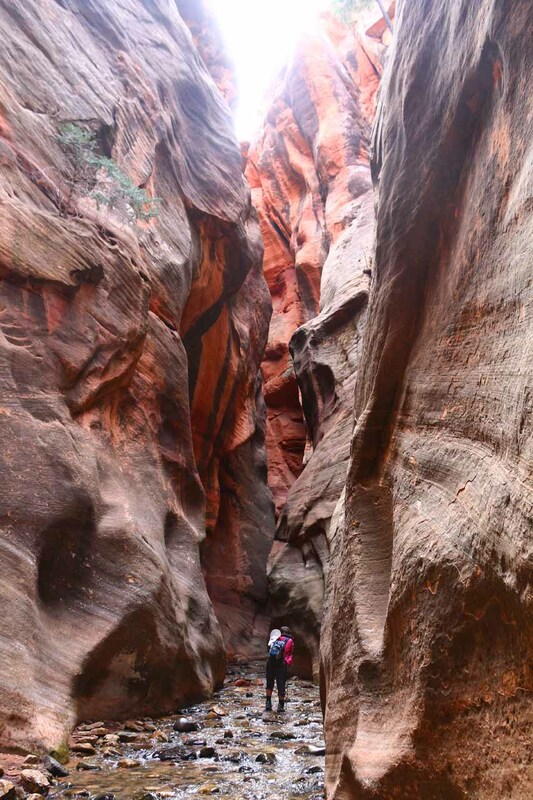 And in my mind, just being in these narrows were as much of a highlight as the main waterfalls themselves. While I tend to think of Kanarra Creek as a relatively quieter alternative to the more famous Zion Narrows (though this statement tends to understate its popularity), I made this association because we had to get wet and spend a good deal of time wading within Kanarra Creek (as opposed to the Virgin River and its tributaries). 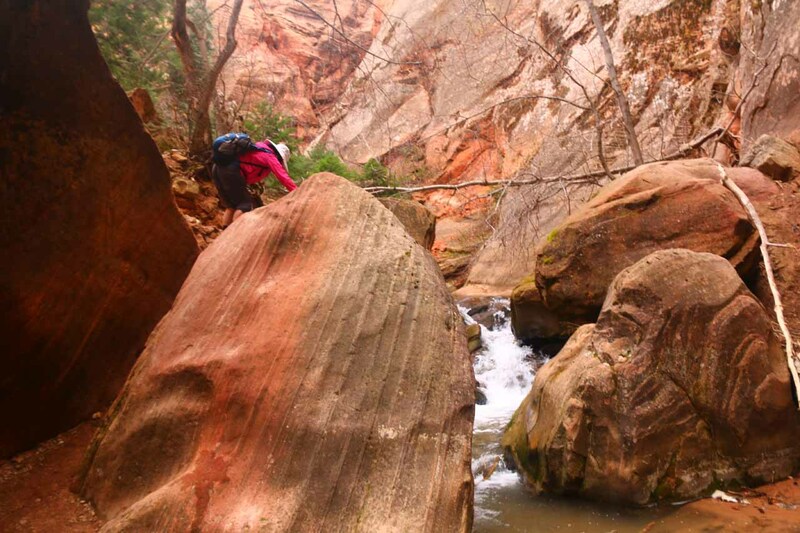 That said, I found this hike to be more challenging than the Zion Narrows hike because each of the handful of waterfalls were also tricky bouldering obstacles. 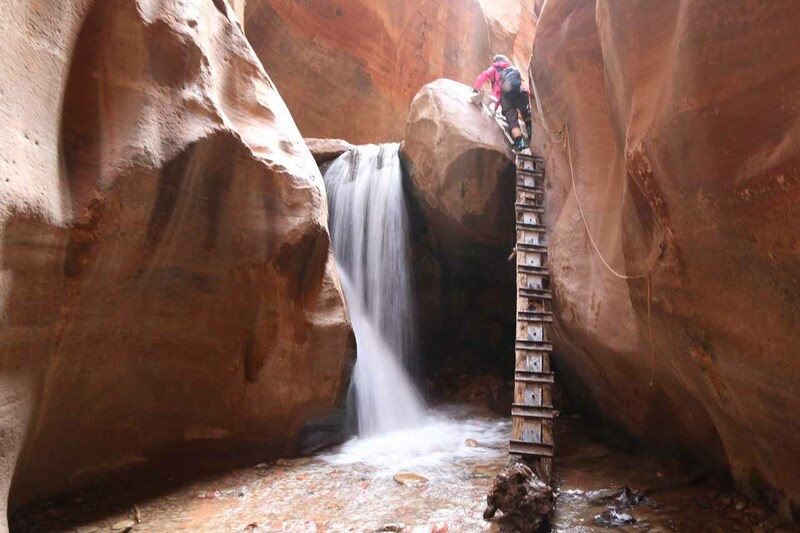 And even though there were ladders set up to get by the tallest of the waterfalls (which were typically on the order of 15ft or so), the last ladder we encountered was also deceptively dangerous due to its bad condition. In fact, my Mom gashed her knee on one of the metal rungs bolted onto the slippery wooden ladder as the metal was sharp. 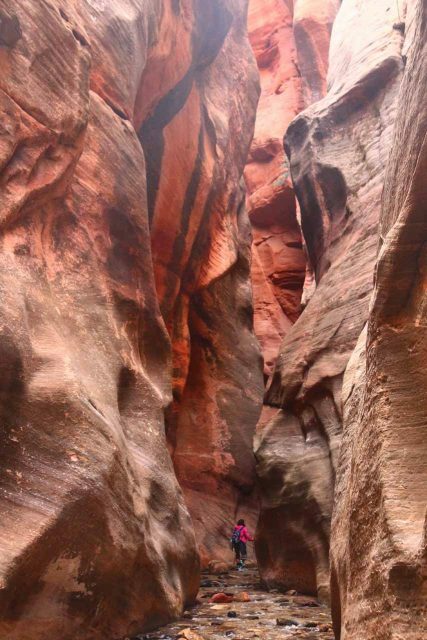 Speaking of the hazards, I noticed many people who came into this canyon unprepared. 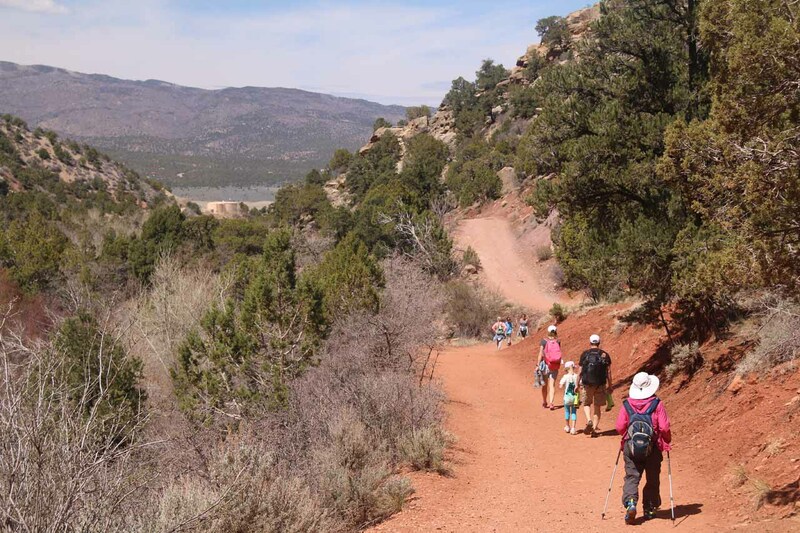 Some attempted to do the hike in rain boots, flip flops, or old sneakers while others brought young kids (even toddlers and babies in carriers) onto the hike. 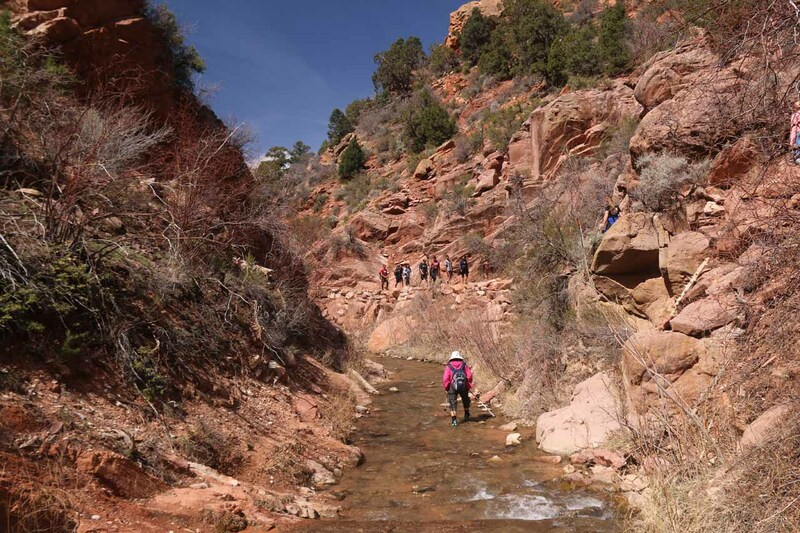 In the dicier sections of the trail, we saw on multiple occasions children crying either because of the obstacles encountered or because of the very cold water or both. Upon seeing the volume of people coming in while we were coming out (some with dogs and others with obnoxious boom boxes or iPhones played out loud), Mom turned to me and said that they had no idea what they were getting themselves into, and I had to agree. 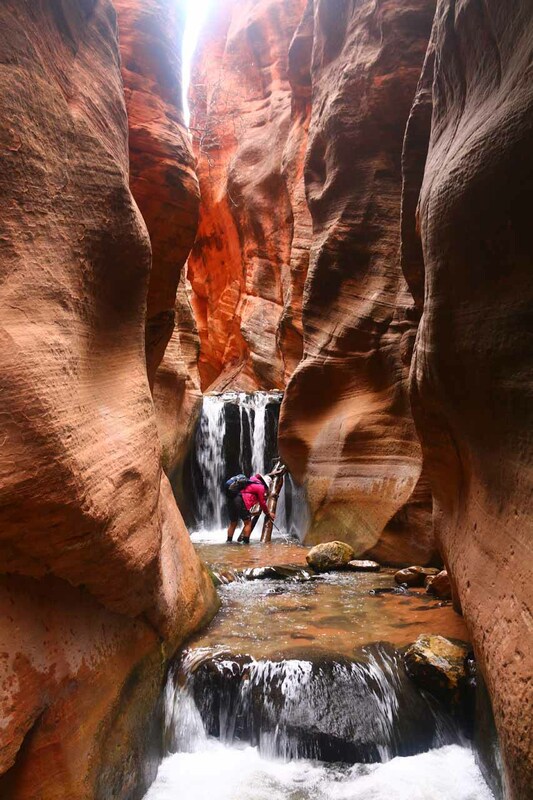 Having done parts of the Narrows twice before (one of them was the entire 16-mile length), I knew that renting canyoneering shoes and neoprene socks from one of the outfitters in Springdale while bringing along trekking poles , was wise. And indeed, not only did our feet withstand the icy cold water thanks to the neoprene socks, but the grip we were getting on the slippery sandstone walls and ledges from the spider rubber of the canyoneering shoes helped tremendously in negotiating just about all of the obstacles except the second waterfall ladder. The hike began from a well-signed parking lot at the far eastern end of the town of Kanarraville (see directions below). Immediately from the parking lot, we went up some steps just past a signboard that accurately warned that this was not an easy hike and that we’d be spending a minimum of four hours away from the car. 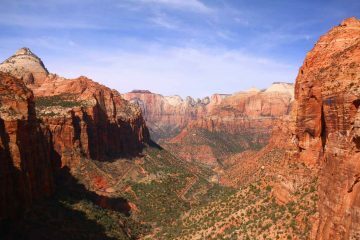 Once we were above the steps, we then had to hike up a dirt road rising high above Kanarraville and peaking at a pair of water tanks accompanied by some kind of cell or radio tower. 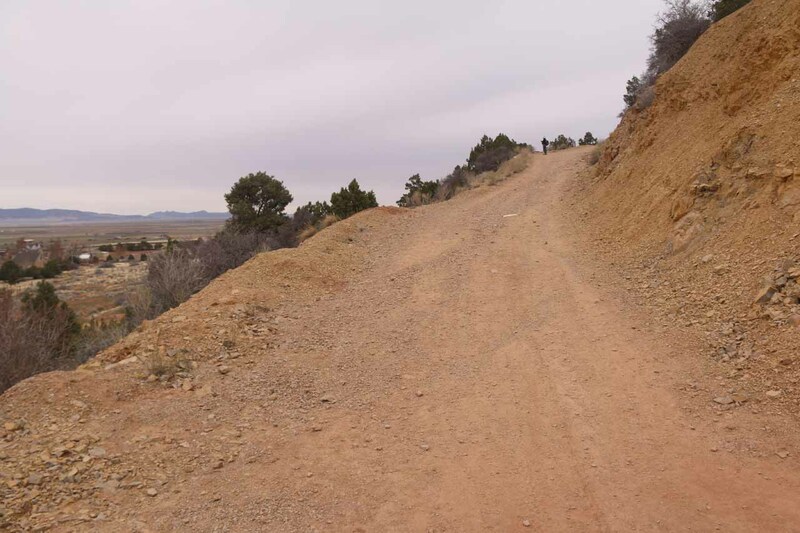 The road then descended to the first crossing of Kanarra Creek (at about 0.3 miles from the start of the hike on the dirt road) before it undulated up and down some minor hills. The road then descended to the next encounter with Kanarra Creek at about 0.4 miles from the first crossing according to my GPS log. 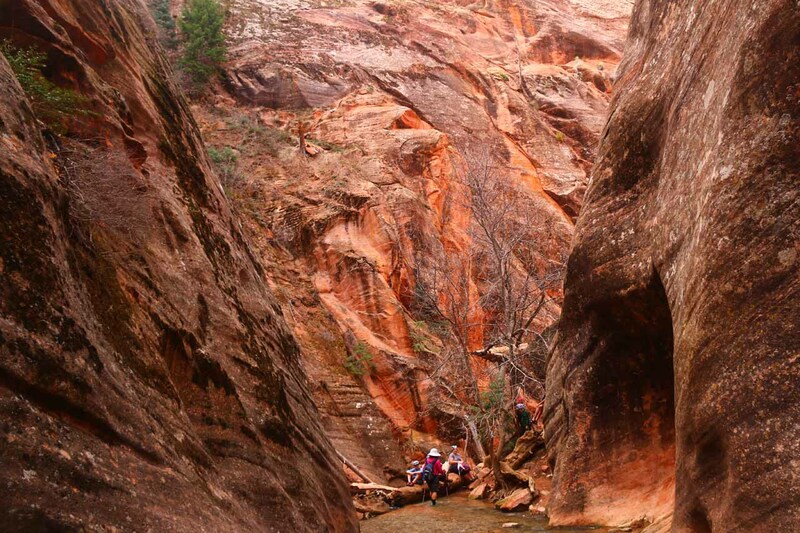 At this encounter, there was a narrow ledge trail that skirted the creek to avoid getting wet. I suspected that this crossing was more for 4wd vehicles that might have to go right through Kanarra Creek to continue on. 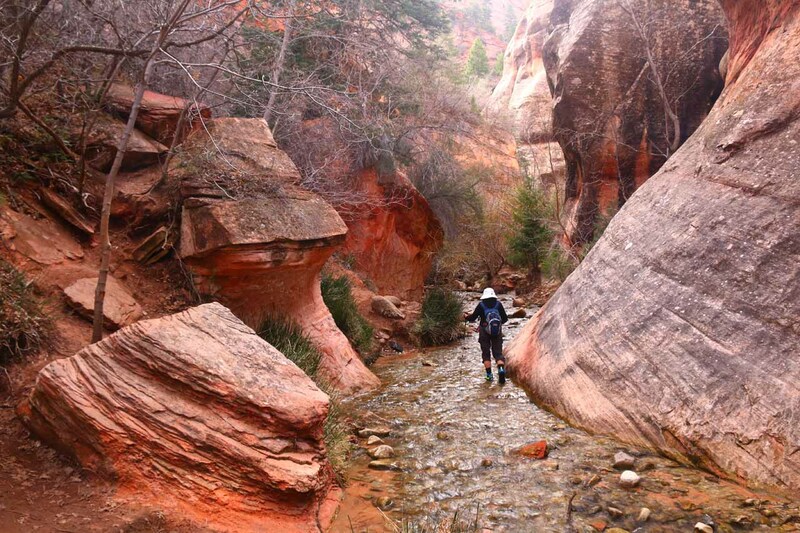 Beyond this creek bypass, we then had to cross Kanarra Creek once again another 1/4-mile later. 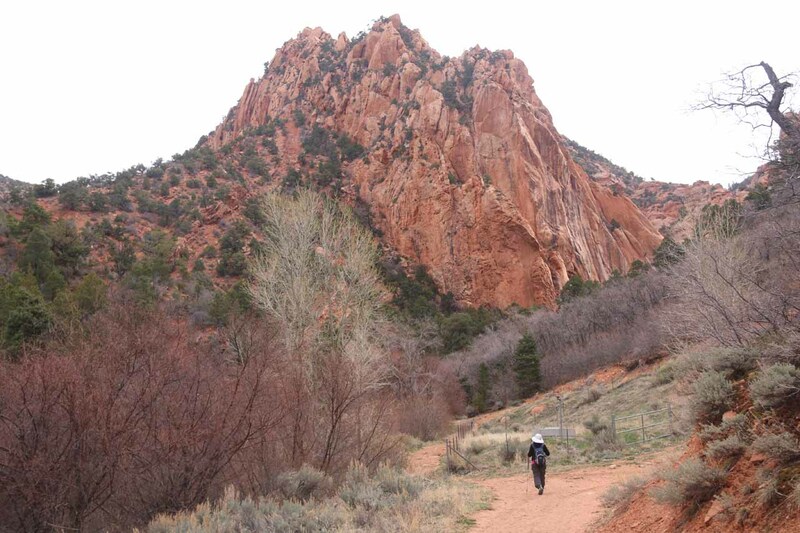 At this point, we started to notice an attractive jagged red mountain that was looming in the background. 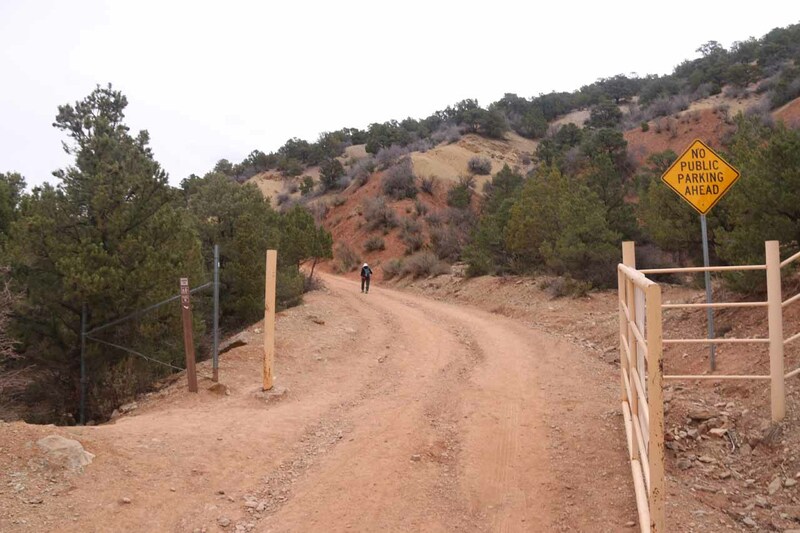 About another 0.1-mile later, we reached some kind of water gauge area that was fenced off. While the gauge wasn’t anything particularly significant scenery wise, it actually helped us identify where the start (or end) of the defined trail was as the 4wd road pretty much stopped at this gauge. 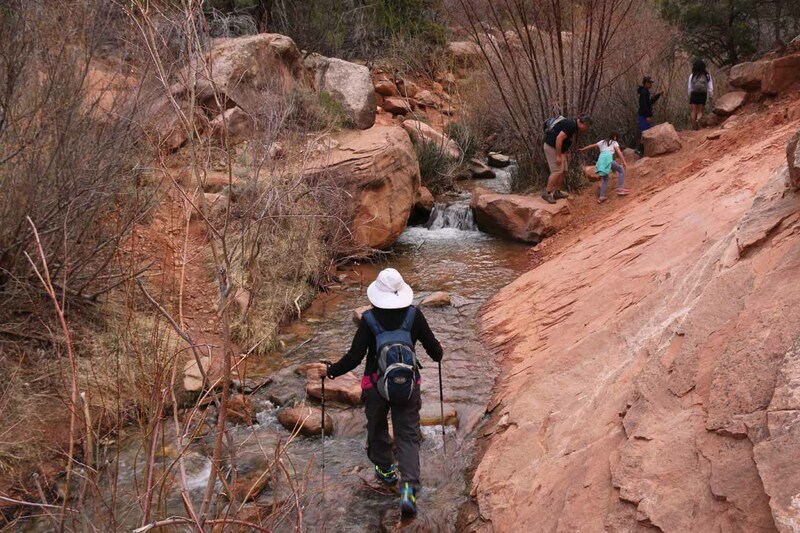 It was especially helpful to us on the return hike, when we realized where it was best to get out of the water and move quickly on dry land (i.e. the dirt road) once again. Beyond the gauge, the trail pretty much degenerated into a network of sketchy false trails all pretty much due to futile attempts by prior hikers to avoid getting wet in Kanarra Creek. I’m sure the degree of erosion that was taking place here exposed a lot of boulders clinging onto edges (as well as water pipes sending drinking water to the town of Kanarraville), and I can envision someone getting hurt or the soil/water quality becoming compromised at this point. 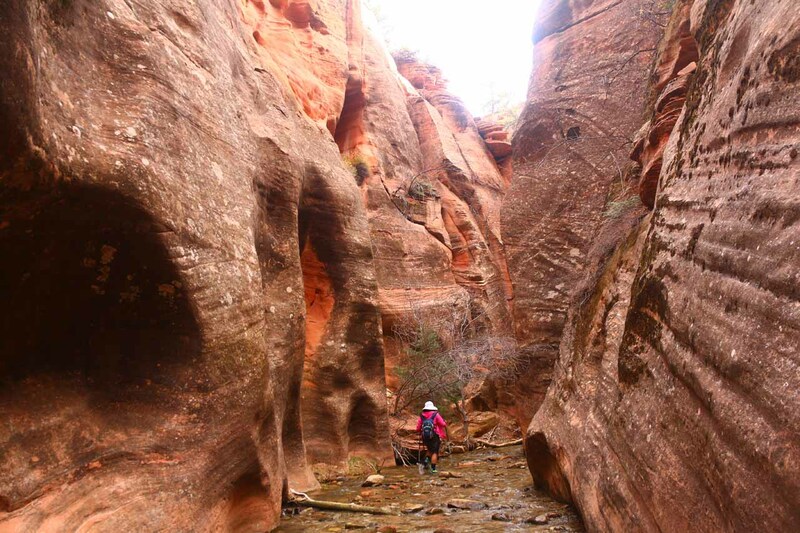 While Mom and I didn’t commit to getting wet until another quarter-mile further from the gauge, in hindsight, it probably would have been easier to just give in and slosh our way upstream through Kanarra Creek the rest of the way. 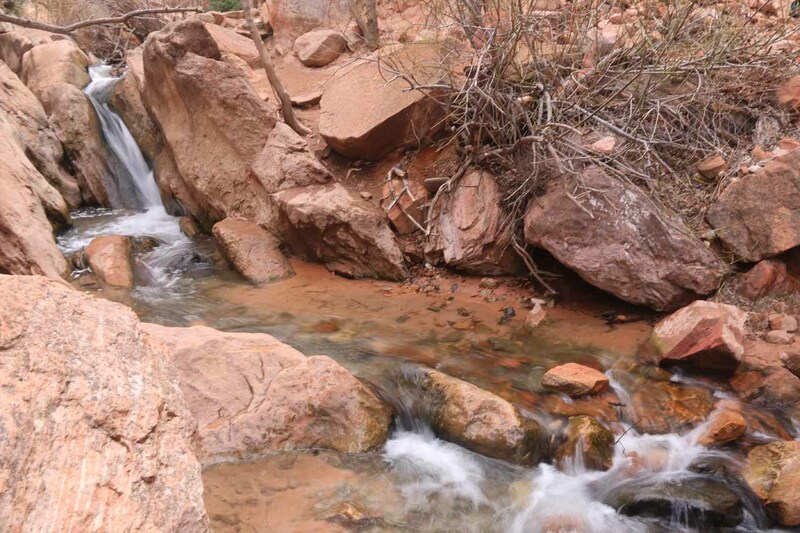 At nearly 0.3 miles beyond the gauge, we encountered our first somewhat significant waterfall on Kanarra Creek. This slanted chute-like waterfall was probably about 5ft tall, and there was a trail that went around it up the right side beyond a creek crossing shortly downstream of the bottom of the falls. 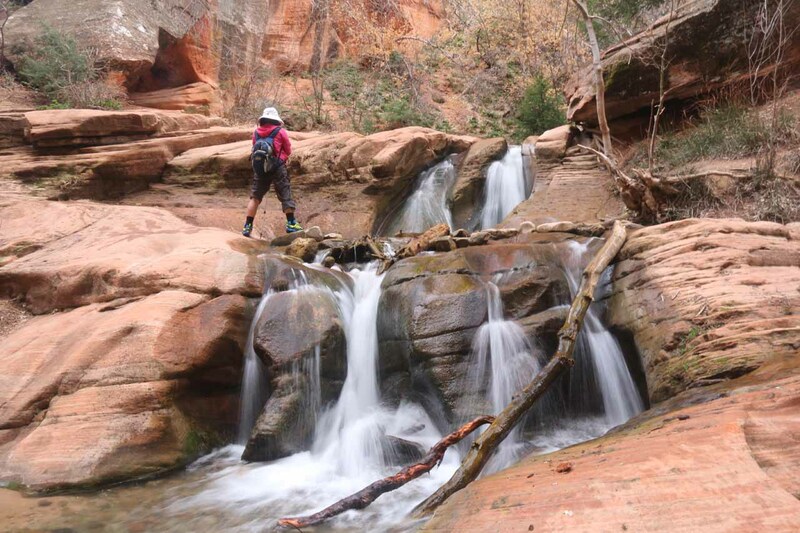 Beyond this waterfall, the hike pretty much criss-crossed and stayed within Kanarra Creek as we hiked amongst shallow sandstone walls. Since we were well past the resistance to getting wet at this point, this part of the hike didn’t present any particular challenges or scenic sections of note. However, at about 0.3 miles beyond the 5ft chute waterfall, the canyon walls really closed in and we found ourselves at the mouth of the attractive first narrows. 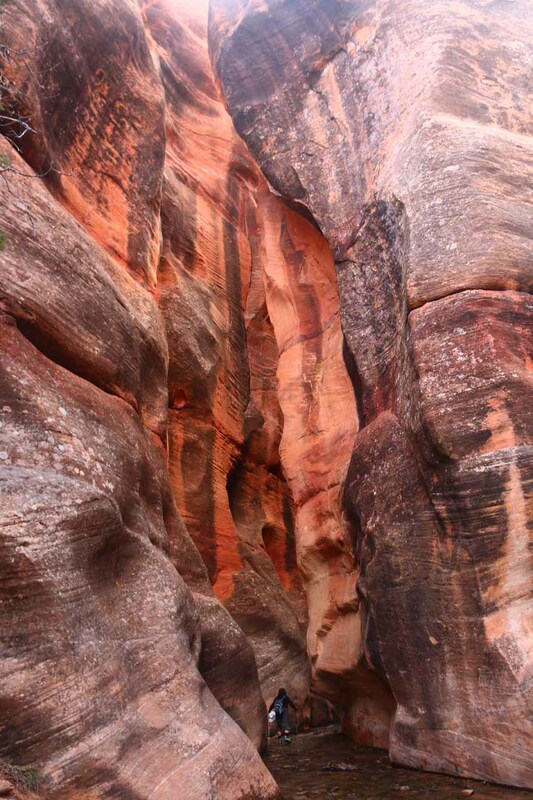 Here, the reddish sandstone walls flanked a section that was wall-to-wall Kanarra Creek. As we sloshed our way further upstream past a couple of very scenic bends, we’d eventually reach the loudness of the first (and perhaps most photographed) of the main Kanarraville Falls. 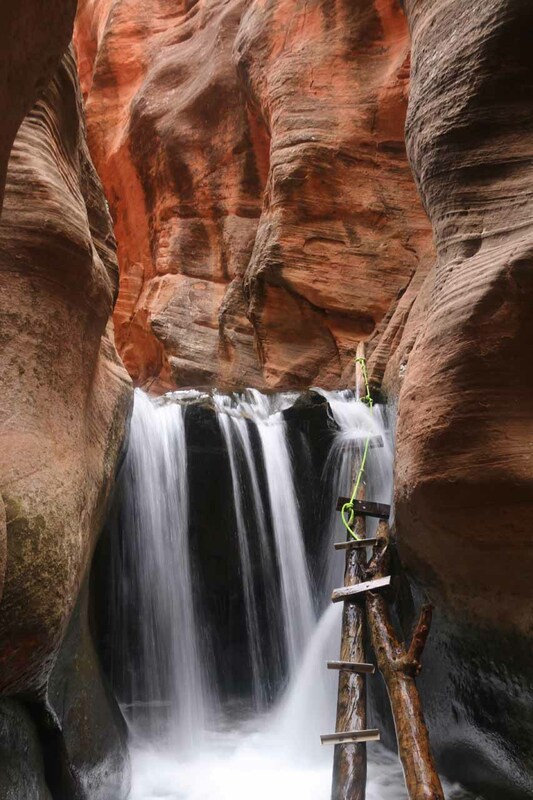 There was a metal ladder that was wedged between the cliffs and a boulder at the top of the right side of the falls. 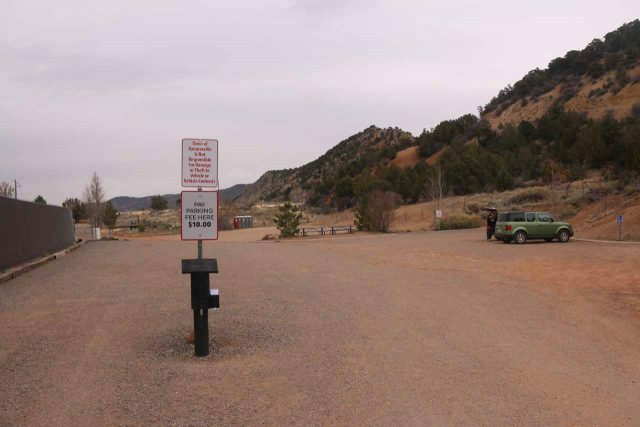 According to the trailhead signage, we were about 1.75 miles away from the parking lot (though my GPS logs suggested it might be slightly longer than that). Given that there was only this one ladder to traverse the waterfall obstacle, we had to wait our turn use it. Towards the top of the ladder, there were a couple of ropes set up to help assist in some of the less sure spots. 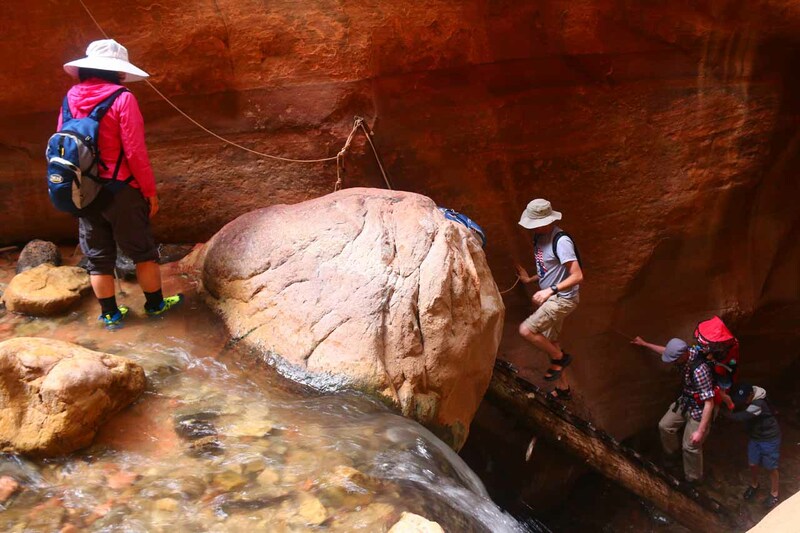 Immediately afterwards, we then briefly continued upstream before we encountered the next waterfall obstacle. 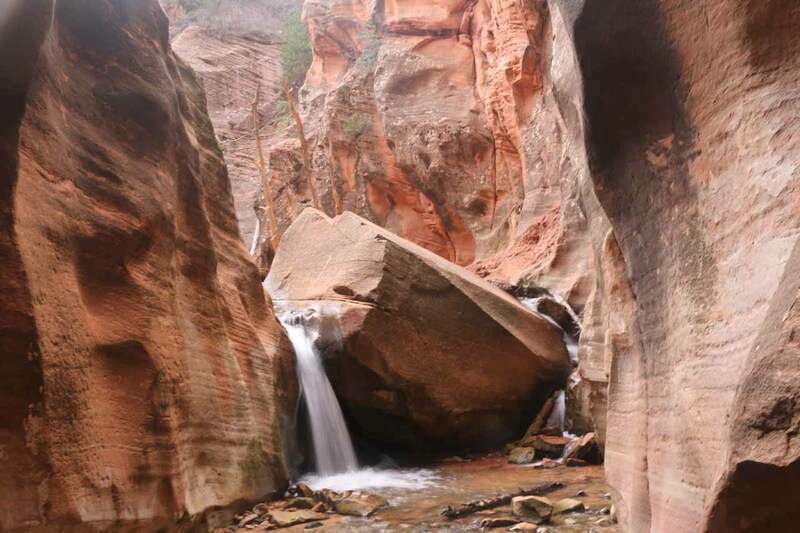 This time, there was a giant boulder that appeared to split Kanarra Creek, where the bulk of this waterfall spilled on the left side. There was an even sketchier scramble up some wedged boulders while getting splashed by the remainder of the cascade on the right side. Towards the top of that scramble, there was a rope set up to help pull up (or control your way down) as of our late April 2018 visit. After this bouldering obstacle, we then continued sloshing our way up Kanarra Creek as the canyon opened up, then choked in near another attractive cascade, which seemed to be at about another quarter-mile or less later (my GPS lost lock due to poor reception from the narrow canyon blocking visibility at this point). There was another obstacle where we were able to squeeze our way up the left side of a giant boulder in order to make it up to this cascade. 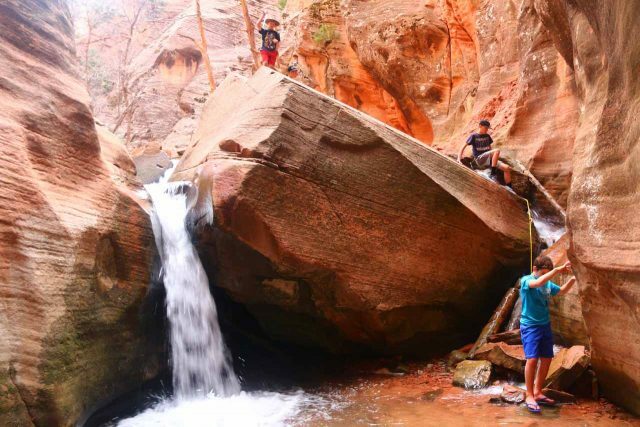 While the two-tiered waterfall was photogenic as it was backed by a red spire-like cliff, I noticed some young visitors as well as locals tried to use one of the tiers as a water slide. 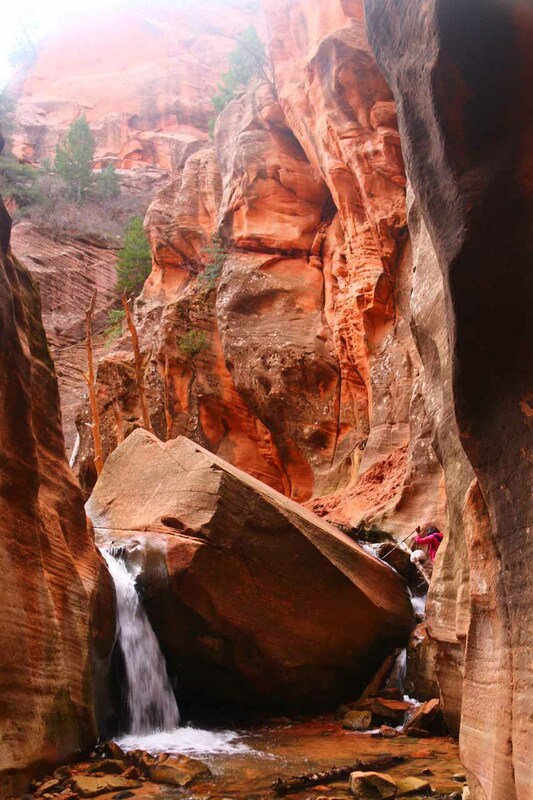 Beyond the cascade, we sloshed around some more upstream along Kanarra Creek as the canyon walls closed in once more before reaching the second narrows. 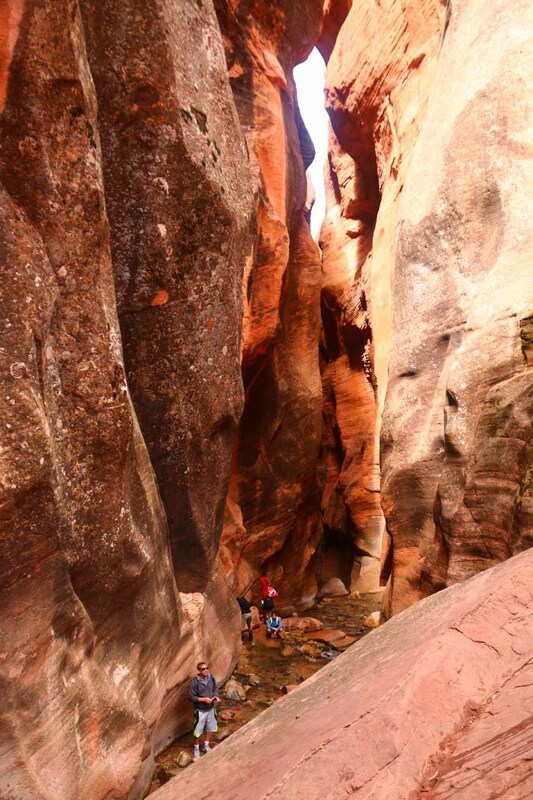 Like the first narrows, it was wall-to-wall creek with tall fluted sandstone cliffs giving this place another dose of scenic allure. 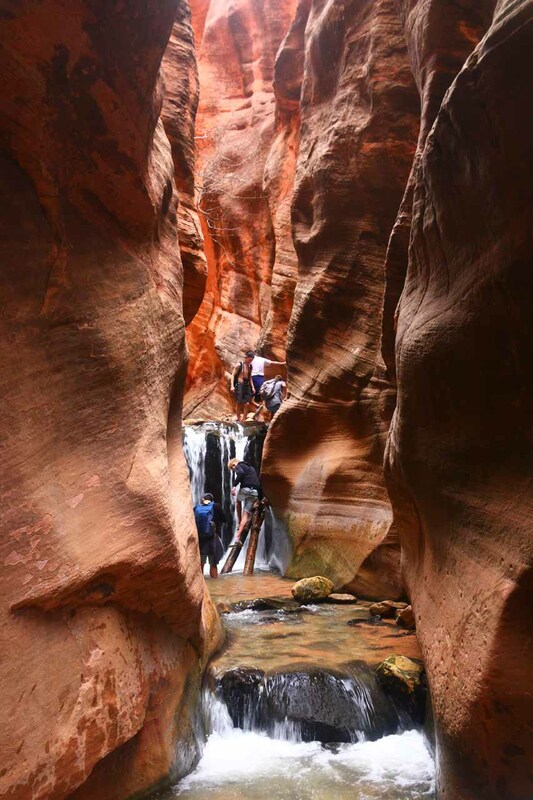 However, unlike the first narrows, there were pockets of thigh-deep pools at the base of some minor cascades that we had to either wade through or skirt around. 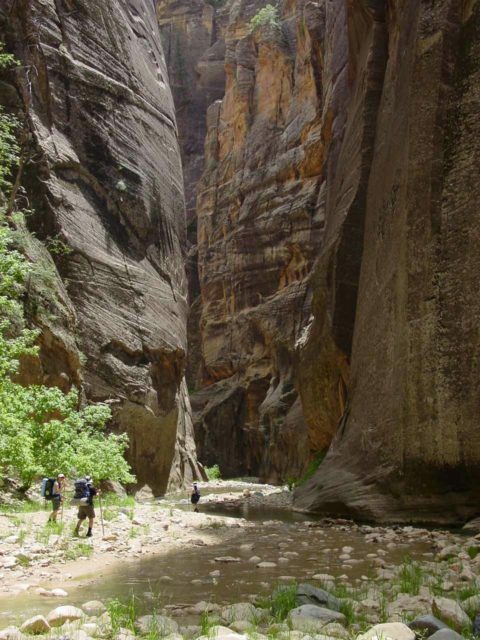 Therefore, the scrambling obstacles were more prevalent in this narrows than the first. A few more minutes of upstream scrambling up this narrows (roughly 2.5 hours from the time we got started), we eventually reached the second of the main Kanarraville Falls with a ladder. Unlike the first ladder, which was metallic all the way through, this ladder was wooden with metal rungs bolted in the slippery log. 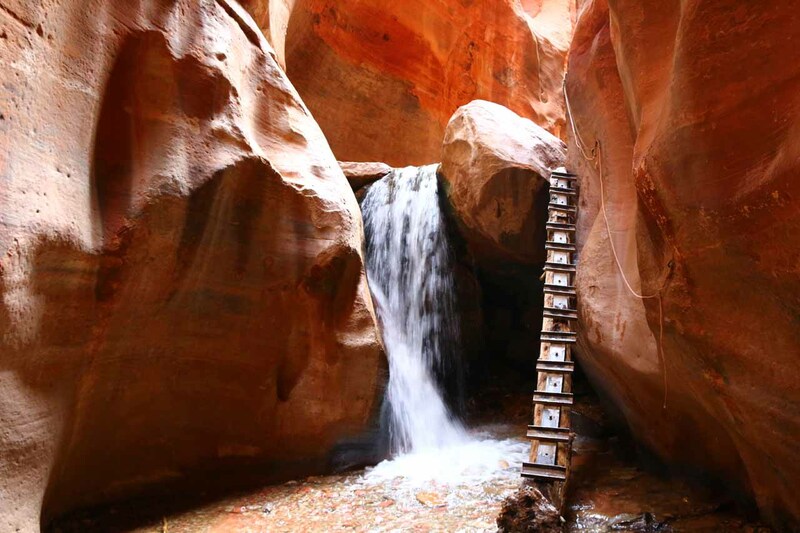 Naturally, the tendency would be to scale this ladder and explore what else Kanarra Creek Canyon had to offer (especially if there was yet a third waterfall further upstream). 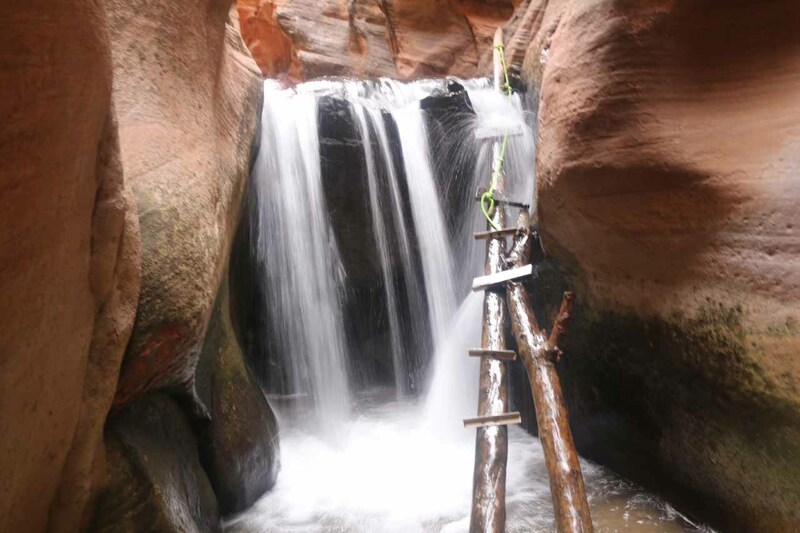 However, as of our April 2018 visit, there were a couple of missing metal rungs as well as one loose one that was spinning as parts of the waterfall was spilling right onto the top of the ladder itself. As mentioned earlier, Mom gashed her knee on one of these metal rungs after slipping on the very first step she took trying to get to the first rung (as the lowermost rung was missing). As a result of her injury and given the sketchiness of the ladder’s condition, this was our turnaround point. 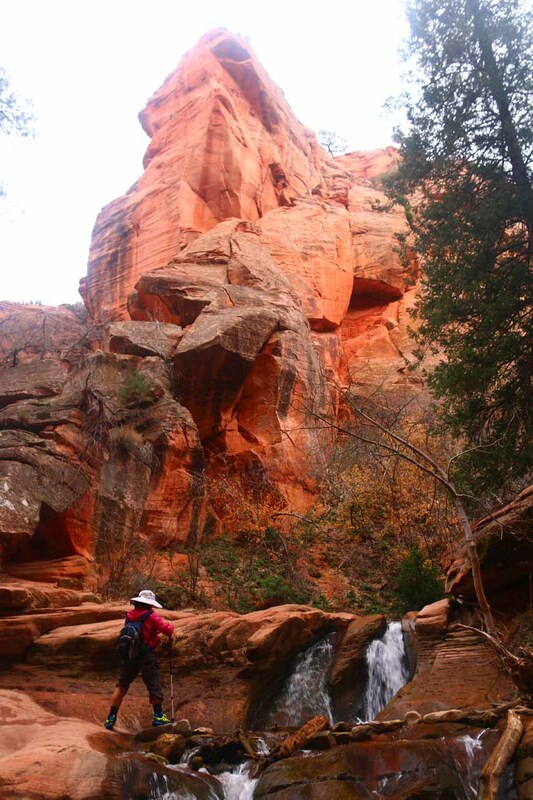 That said, we did see some younger and more nimble-bodied guys make their way further up beyond this waterfall. 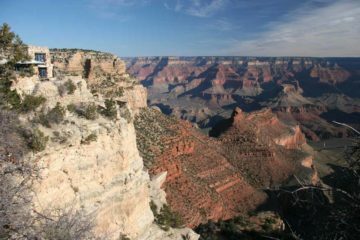 From what they told me, the canyon opened up once again, and it became more open spaces. So apparently, we didn’t miss out on much by choosing not to go up this ladder. 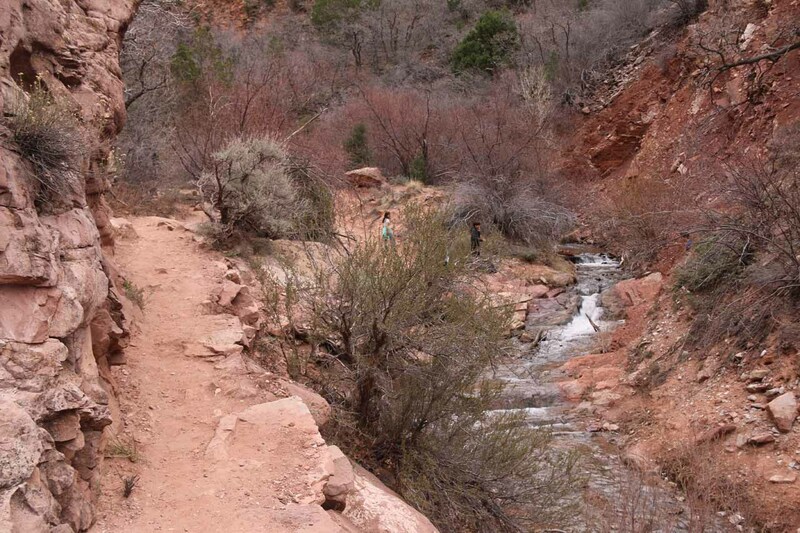 On the way back to the trailhead, the hiking actually went a bit faster since we were going downstream. We also didn’t waste any more time trying to avoid getting wet until we got to the stream gauge. 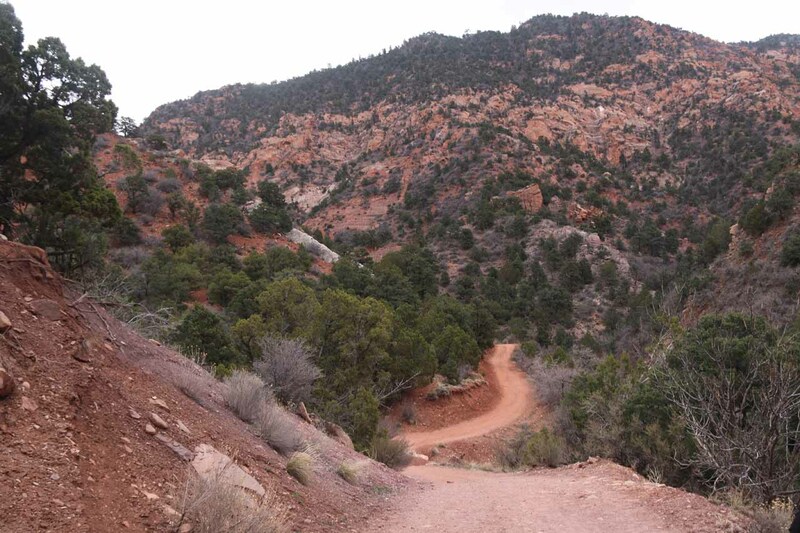 By that point, we were back on the dirt road. 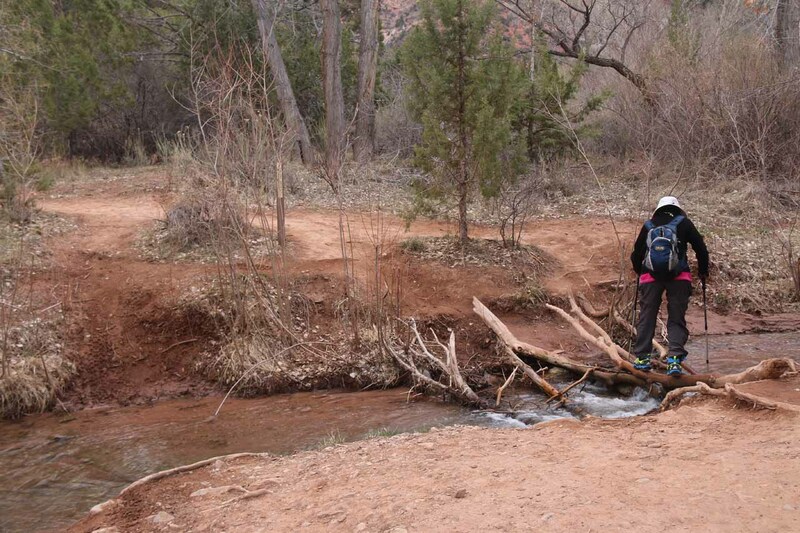 But whenever we encountered another stream crossing, we just went right through instead of trying to stay dry. 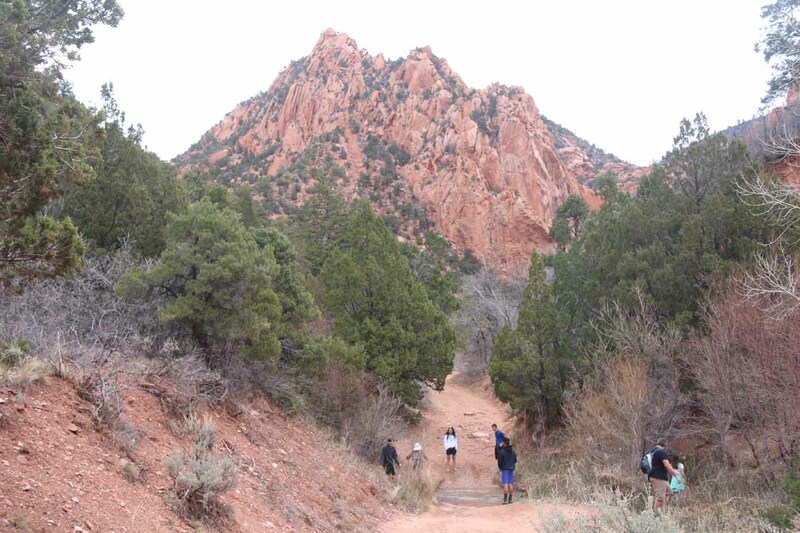 By the time we made it back to the trailhead parking, we had spent about 4.5 hours total on this excursion. 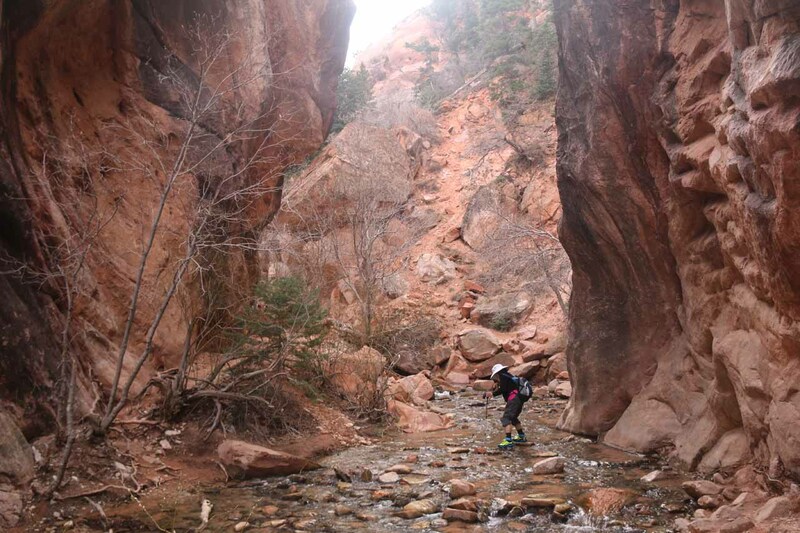 That said, we couldn’t wait to get out of the neoprene socks and canyoneering shoes to let our feet breathe once again. 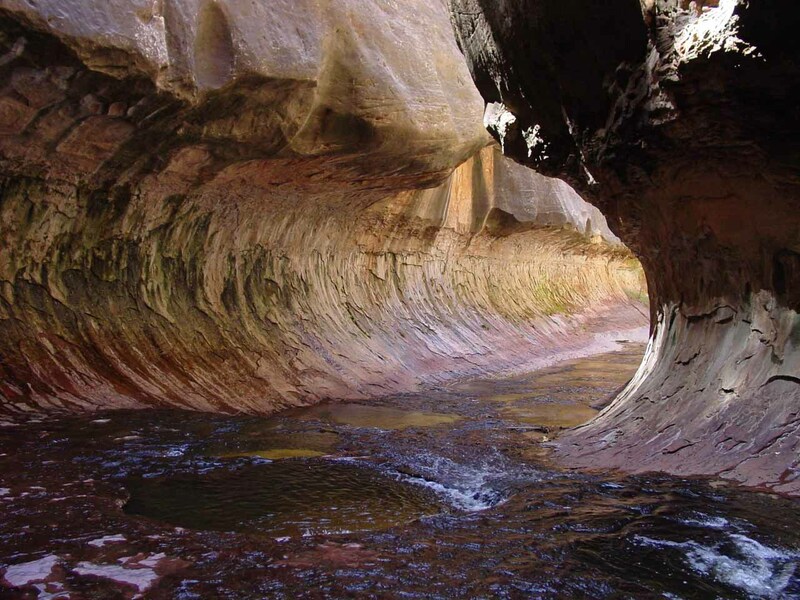 Finally, we do have to mention one last thing about accessing Kanarraville Falls. 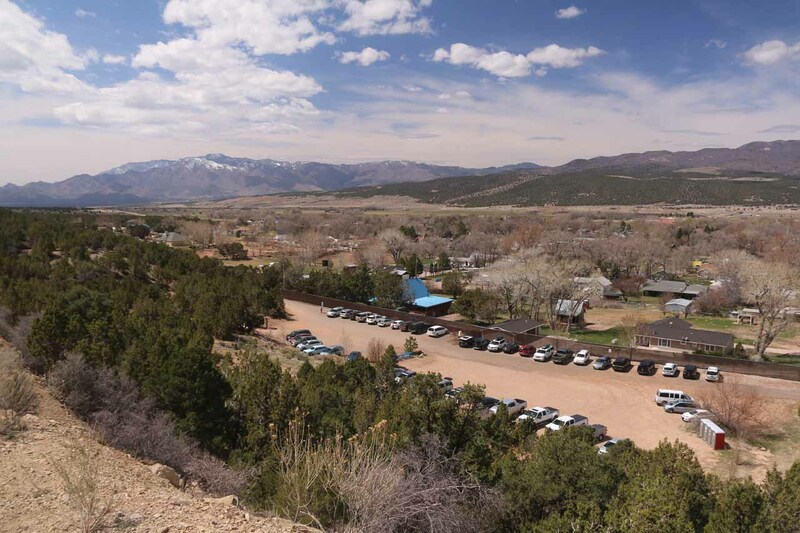 Due to the volume of visitors to Kanarraville Falls (both prepared and unprepared and/or not respectful), the residents of Kanarraville are seeking to limit the visitor numbers in order to protect their drinking water from unsafe levels of contamination. There are currently plans in place to institute a permit system much like the Coyote Buttes Wave and the recently-instituted Subway hike in Zion’s Kolob Terrace section. 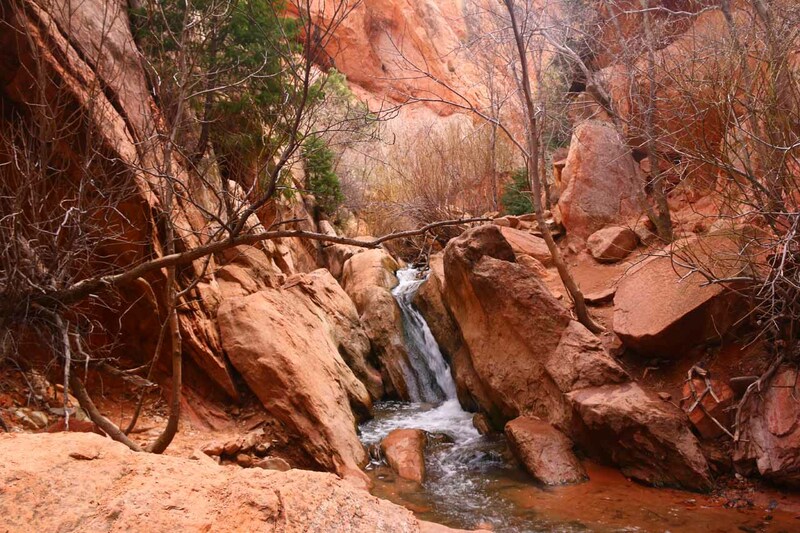 Thus, the access to the falls could very well change by the time you read this writeup. 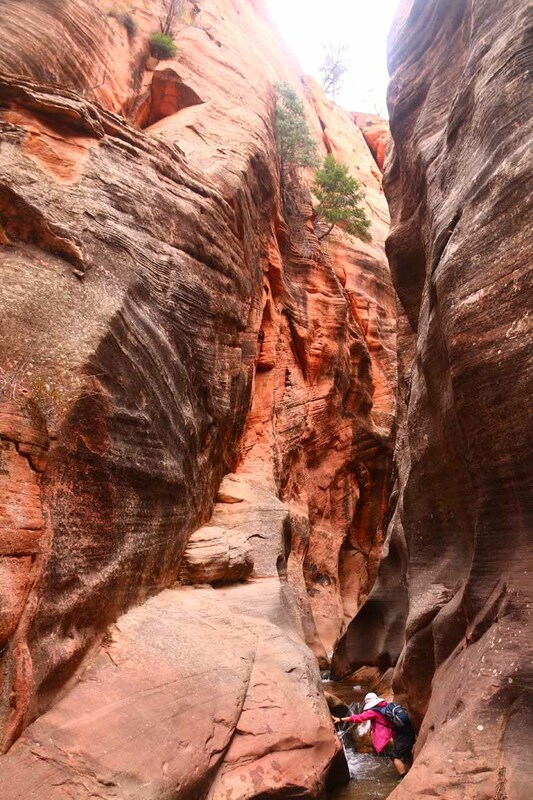 The Kanarraville Falls (or the Kanarra Creek Canyon) trailhead access was surprisingly straightforward to reach. 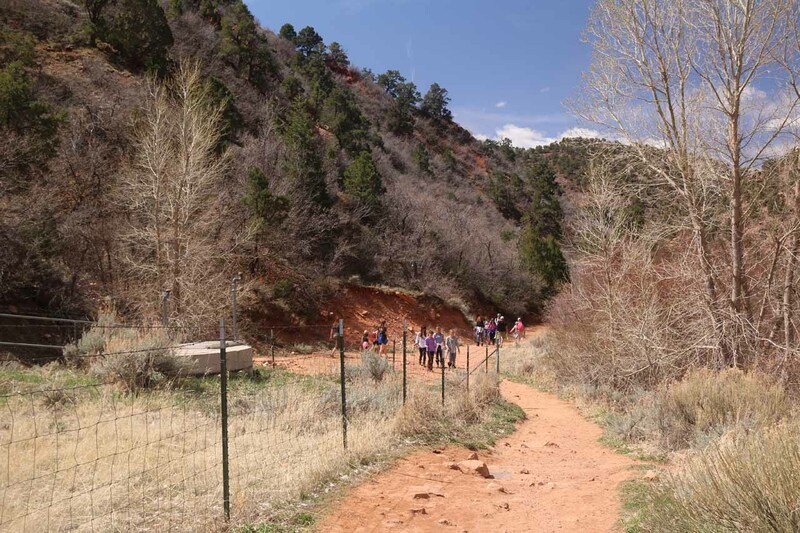 Perhaps this was one of the main reasons why Kanarraville residents are very concerned about water quality and other nuissances that come with the popularity of this hike. This was especially the case since it sat off the I-15 between St George and Cedar City. We’ll start with the directions from St George first. Heading north on the I-15 from St George, we’d drive north on the I-15 for about 35 miles to the New Harmony Kanarraville exit 42 (it was shortly north after the exit 40 for the Kolob Finger Canyons). At the end of the off-ramp, we then turned right, then turned left onto the Old US 91. 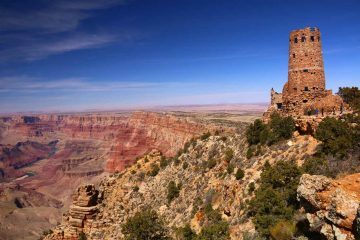 After about 4.5 miles on Old US 91, we entered the town of Kanarraville, and followed the signs, which directed us to turn right onto E 100 North St. Then, we drove the remaining 0.4 miles to the nearest trailhead parking lot on our left. As of April 2018, there was a $10 self-help pay and display system in place during our visit. There were also a row of porta-potties at the far end of this parking lot. There was also another parking lot that appeared to be private. It, too, costed $10. 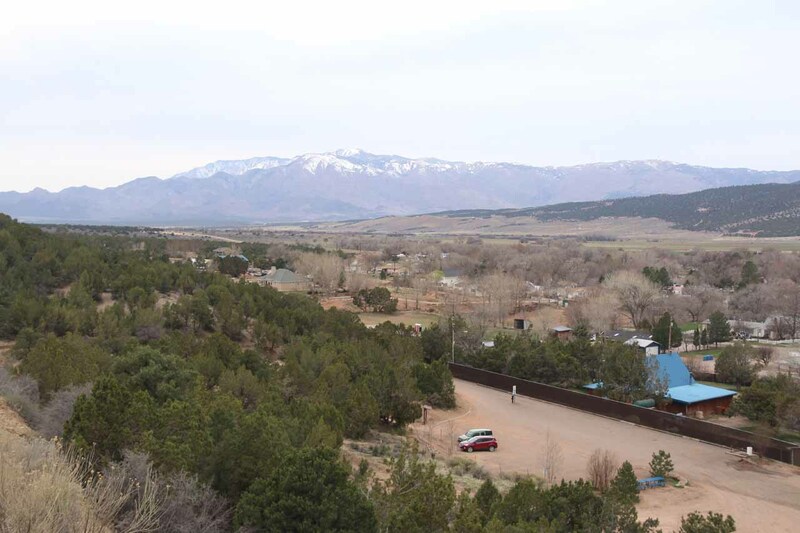 Heading south from Cedar City on the I-15, we’d drive south for about 6 miles to the exit 51 for Kanarraville Hamilton Ft. Once at the end of the off-ramp, we’d turned left onto the Old US 91 and drive south for about 4.5 miles before turning left onto E 100 North St in the heart of Kanarraville. 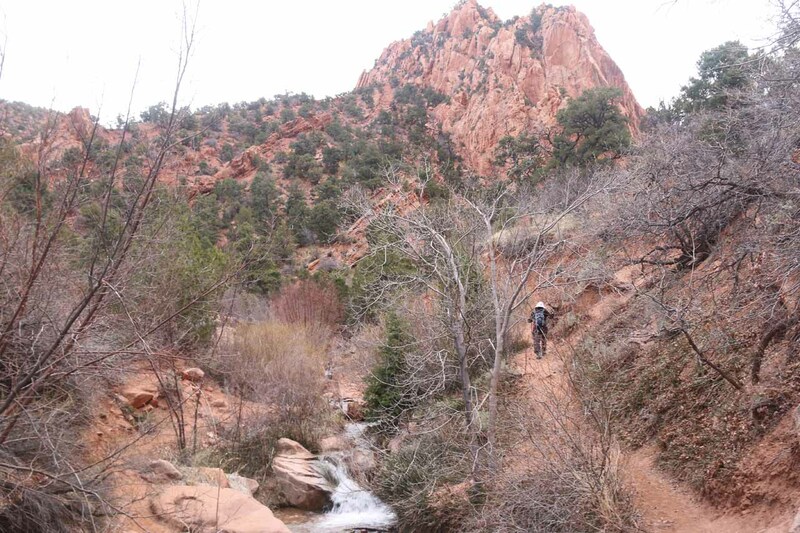 Then, we’d follow E 100 North St to the trailhead parking. 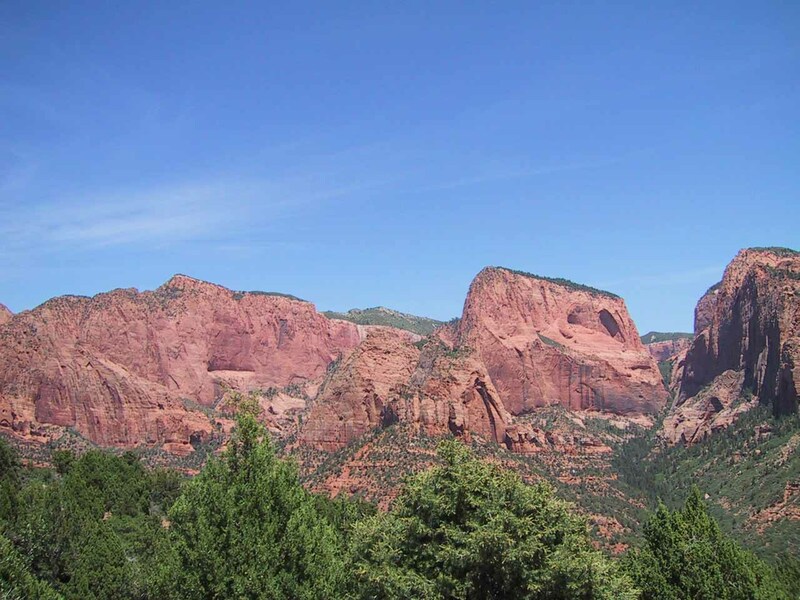 For geographical context, Cedar City is about 52 miles (less than an hour drive) north of St George, 57 miles (over an hour drive) north of Springdale, 76 miles (about 90 minutes drive) west of Bryce Canyon City, 154 miles (over 2.5 hours drive) west of Page, Arizona, and 170 miles (over 2.5 hours drive) northeast of Las Vegas, Nevada.